Yes, we tell ourselves that banana ‘bread’ is just that, a quick bread. A distant cousin of the more attractive cake that happens to share nearly the exact same ingredients and have a strikingly similar texture once baked. Well I’m here to end the confusion. It’s time to give up, give in, and get in the kitchen because I’ve created this Banana Snack Cake — just for you. The recipe’s adapted from my now popular Cold Brew Banana Bread recipe. You simply cream the butter and sugar for a bit longer, decrease the bake time and gob on some frosting — finally admitting to yourself, after all of these years, that banana bread ain’t exactly part of a wholesome breakfast. You can spend time making this cake into a gorgeous, impeccably frosted masterpiece that would rival those of Don’t Tell Charles. Or, you could do what I did and slap some frosting on it right when it comes out of the oven, the brown buttery and pleasantly sweet goodness every-so-slightly melting into the crevices of the cake, its nutty vanilla notes delighting your tastebuds as you think to yourself “it has bananas so it must be healthy.” When I tell you that this snack cake is the best recipe I’ve ever developed, I’m not spinning a tale. It’s so good in fact, that I forgot to take pictures. 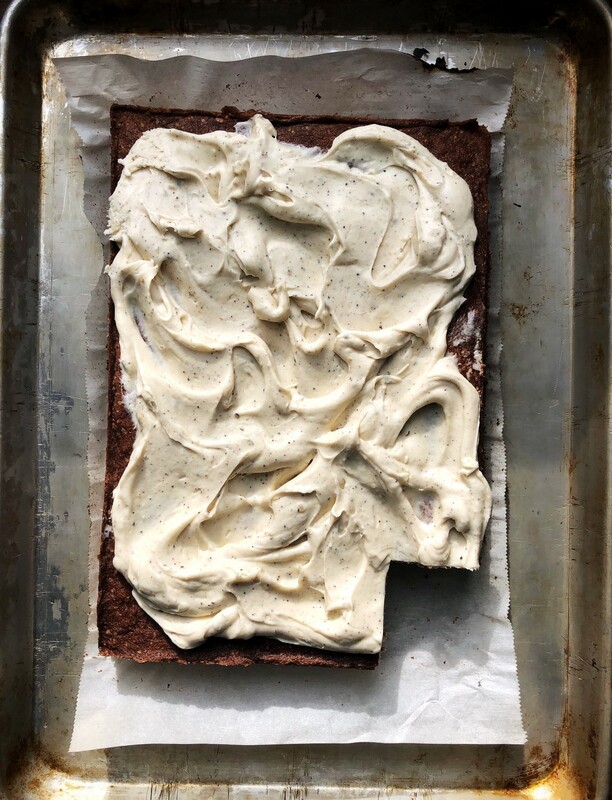 My friends and I promptly devoured the first sheet cake and hid the other before the most primal of us could stage a coup; holding the other cake for ransom and forcing the lonely baker (me) into the kitchen to crank out yet another. What if I don’t have super ripe bananas? — Okay so I don’t want to be the one to give away trade secrets here but pssst. You can ripen your bananas in the oven, for on demand homemade banana bread. Simply line a baking sheet with parchment paper, and bake on 300℉ (150℃) for about 30 minutes, or until the peels are black and the insides are mushy. Pre-Heat your oven to 350℉ (180℃). Combine flour, salt and soda in a separate bowl. Add the vanilla to the butter mixture and continue mixing until light and fluffy. Add the eggs to the butter mixture one at a time, making sure that the batter is mixed between additions. On low speed, begin adding the flour to the wet mixture, alternating with the buttermilk/sour cream. When the flour and buttermilk are completely added, scrape down the bowl and mix until combined. Add the mashed or puréed bananas to the batter and mix until combined. Spray two 9" by 13" sheet pans with nonstick spray and fill with the banana bread batter, using an offset spatula to smooth the batter’s surface. Bake the banana bread for 30 to 40 minutes, or until a toothpick comes out clean when inserted in the center. 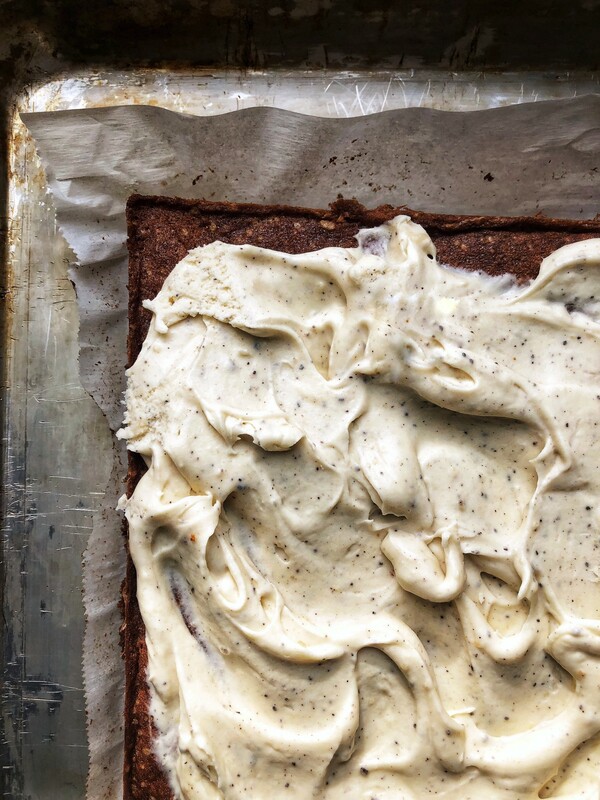 While the banana bread is baking, make the frosting. Brown the butter in a small saucepan and then set aside to cool. If you don’t know how to brown butter, check out this guide. Using a stand mixer or hand mixer fitted with the whisk attachment, beat the cream cheese and now-cooled and soft brown butter in medium high speed until combined. Add the confectioner’s sugar and mix, slowly increasing the speed so that the sugar doesn’t fly all over the place. Add the vanilla extract, lemon juice and salt, mixing once more to combine. Set the frosting in the fridge to chill while the cake cools. Assemble the snack cake by spreading the frosting on the cake’s surface. The cake doesn’t have to be completely cool to do this, but shouldn’t be hot. Use an offset spatula or cake scraper smooth the frosting and create swoops on the top of the cake. Cake can be served immediately or wrapped and refrigerated for up to 3 days. You can find @thymeforbreakfast on Instagram!